Do I need a computer to use VoIP? Can I make calls while using the Internet and my computer? What are my local telephone number options? What about call quality on VoIP? My business might be moving offices. Will I have to buy a new phone system? The “Cloud” is software that is installed on a remote server somewhere in the world and you access via the internet. This is a shift from the past when you would purchase a piece of software and install it on a particular machine, and then access that software only from that machine at that particular location. The Cloud allows access that same piece of software from any computer or device with an internet connection, opening up a whole new world in terms of productivity alone. Many of us are already using cloud-based software. Apple’s online storage account, Shutterfly, Dropbox, OneDrive are all examples of widely used cloud-based services. Voice over Internet Protocol (VoIP) is a technology that works by converting sound into digital voice communication. Instead of sending and receiving calls over "traditional" copper landline telephone infrastructure, that information is instead sent over an active Internet connection. The way that voice data travels over the Internet in this situation is virtually indistinguishable from any other type of data, with e-mail being one of the more prominent examples. With VoIP, you have a wider range of options regarding who you can actually call at any one time. You can make computer-to-computer calls, you can call a cell phone, or a landline like you could in a traditional setup. Unlike on-premise phone systems, VoIP systems do not require a lot of equipment since they are cloud based. A typical VoIP setup requires a router and a switch, but not always depending on the size of your operation. IP Phones can be utilized or with mobile apps, you may prefer to use your cell phone or computer to make calls. For any VoIP system to work, you need adequate broadband internet connection. IP phones are digital telephones that connect directly to the internet via a router. These phones come in both cordless and corded models. VoIP phone calls require a high-speed broadband connection. As a general rule of thumb, your broadband should be able to sustain an approximate rate of 80Kbps. However, if you want to use more than one VoIP line at the same time, then you should first make sure that your broadband connection can handle the additional calls. A good formula to use is 80Kbps x the number of phone lines = the sustained broadband connection speed that you will need for high quality calls. To check your current bandwidth, you can use an online tester like www.speedtest.net. No. With most VoIP service providers, you do not need a computer. You can just use the phone. You do need a computer if you are going to be using the softphone feature since your computer becomes the phone. You may also prefer to use a computer to manage your online account via an admin portal as it is easier to work on than a cell phone. 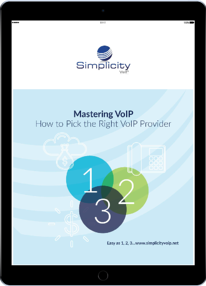 Most providers will allow you to continue to use the same number when you start your VoIP service. If you want to keep your current number, ask about the process of porting (moving) it rather than starting with a new number. One of the greatest benefits of VoIP is that you can have a telephone number assigned to you no matter where your business is located. Businesses often want to have a local presence in many different cities with a local phone number for customers to call. Business VoIP service allows a customer to call a local number that can be directed to the company anywhere in the country. Businesses get virtual telephone numbers in local cities so that employees can call them without incurring long distance charges. The quality of VoIP voice is typically better than or equal to the quality achieved by a traditional landline phone. Since most call quality issues are caused by network connectivity problems, as long as you have an adequate broadband connection you will experience crystal clear calls. Before you sign up for a VoIP service, you should test your broadband connection to ensure that it delivers the required speeds. What affects call quality and the causes? VoIP technology works by converting sound into digital packets that are sent over an active internet connection. When data packets arrive out of order, you experience audio jitter which sounds like a stutter. This is when the person you are speaking to can only hear about every third word of your conversation. This issue is when you hear your own voice talking back to you or when you hear the feedback of the person with whom you are speaking. This is when a call is made and the caller can’t hear the other party but the other party can hear them. Latency or packet loss can cause the issues above. The time it takes for a voice packet to reach its destination is latency; a delay causes call quality problems. When voice packets are dropped due to a congested network router or switch, or discarded by the jitter buffer, you can have packet loss. No, VoIP phone systems are easy to move and change. As long as you have access to high-speed broadband, you can simply bring your VoIP phone system with you. All you will need to do is connect your computers and handsets at the new location, and you will be able to instantaneously start making and receiving calls. Yes! I want to learn more about picking the right VoIP provider.